I am not a foodie. I don’t eat non-veg, I don’t drink alcohol, so I can’t optimal use of an invite or opportunities where these are free. Myself and about a dozen other bloggers from Chennai were invited to check out the Annalaya Restaurant. I opted In this post as I realized that this is a pure veg restaurant. Annalaya is the new veg fine dining restaurant in Chennai, in Nungambakkam area. It is located just off the main road, near Vijay TV office, closer to Univercell store. Annalaya is not a super expensive place to eat. Their rates are reasonable. We were served south Indian meals to begin with, served on traditional banana leaves. Rasam and buttermilk were kept next to each seat. Meals was good- like any traditional south Indian meals should be. A special variety of masala dosa comes with pink Masala- potato and some beetroot. In the dessert department Gold Kabana is their signature item, which involves a special variety of rice, sweetened and sprinkled with golden dust, supplied with vanilla ice cream. 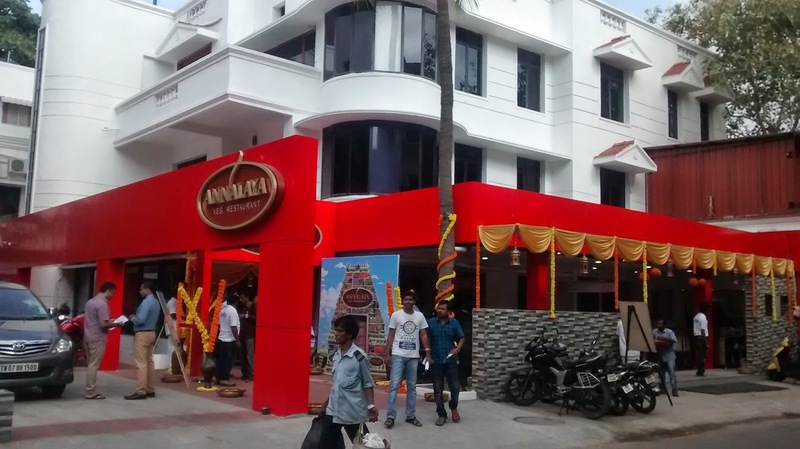 Annalaya has a seating capacity of about 40-50 pax inside. I spotted around 20-30 staff around during our visit. That is about one staff for 2 guests, which if sustained during peak hours, would help each customer get good attention. Exteriors of the Annalaya restaurant were being worked upon when we visited. Annalaya will be launching on 21st April. Do visit them. Update: Went for their launch today. The Restaurant is now ready to serve its customers. Do check it out.